Among the most vilified of men in colonial Massachusetts was Judge Peter Oliver (1713-91) who served as Chief Justice of Massachusetts between 1772 and 1775 and who split his residence between Middleborough and Boston. 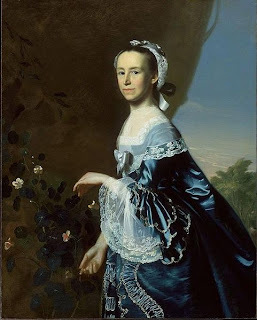 Oliver's staunch Loyalism increasingly placed him at odds with much of the public following 1765 and public resentment of Oliver was fueled by Mercy Otis Warren (1728-1814) who satirized Oliver and his associates in a series of political plays in the early 1770s. No friend to the Olivers, Warren proved how cutting satire could be as she lampooned her victims. Warren's later biographer, Alice Brown, sympathized to a degree with the Loyalists as honest men who simply sought to do their duty to God and King. Yet it should be recalled that Loyalists, too, engaged in similar harshly satiric and biting attacks upon their opponents and Peter Oliver in particular was (and remains) well known for his condescending attitudes towards those with whom he disagreed. In The Adulator (1773), Warren's principal characters are based upon Oliver, Oliver's brother Lieutenant Governor Andrew Oliver, and Hutchinson (by then Governor of Massachusetts). The names which Warren gives are suggestive. Hutchinson is "Rapatio", Andrew Oliver is "Limput" and Peter Oliver is "Hazelrod", hazel rods being notorious weapons of corporal punishment. Thou firm abettor of my grand design! Thou now canst cover what the world call crimes. In the play, Warren further describes "Hazelrod" as "highly pleasing to the creatures of arbitrary power, and equally disgusting to every man of virtue." I sold my country for a splendid bribe. I give my tears, and conscience to the winds. While today some have argued that The Group remains but a "literary curiosity", in its day it, along with Warren's other work, was politically important. The connection between Warren's characters and the people whom they represented was fairly transparent, at least among the Revolutionary community. Proud of his wife's abilities, James Warren shared her work with others including John Adams, and it came to be rapidly disseminated throughout the community which at times deprecatingly referred to the real-life characters by the pseudonyms created for them by Warren. Samuel Adams on one occasion made report that "Rapatio is now gone to Middleboro to consult his Brother Hazelrod". Warren's work was also politically persuasive, and it helped fuel the public hatred of Peter Oliver. "To an inflamed patriotism it must have been a vivid delight to find the enemies of peace held up bleeding under the eye of the day, to hear some one voice the hot rancor of every heart and say what all patriots would fain have said themselves had they been clever enough." Intelligent, well-educated, witty and charming, Mercy Otis Warren was an important author, well known for both her anti-Loyalist plays of the 1770s, as well as her later perceptive History of the Rise, Progress and Termination of the American Revolution (1805). She reserved a special dislike for Peter Oliver. Alice Brown. Mercy Warren. New York: Charles Scribner's Sons, 1896. Mercy Otis Warren. The Adulateur: A Tragedy as it is now acted in Upper Servia. Boston: 1773. Reprint: Tarrytown, NY: William Abbatt, 1918. Mercy Otis Warren. The Group, a Farce. Jamaica. Reprinted Philadelphia: James Humphreys, Jr., 1775. Facsimile ed.